Billings is the largest city in the state of Montana, and is the principal city of the Billings Metropolitan Area with a population of 166,855.Billings is located in the south-eastern portion of the state and is the seat of Yellowstone County, which had a 2015 population of 157,048. Discover out-of-the-way places like Custer Battlefield Museum and Custer Battlefield Trading Post & Cafe. You'll explore and learn at Big Horn County Historical Museum and Toucan Gallery. Step out of Billings with an excursion to Little Bighorn Battlefield in Crow Agency--about 1h 40 min away. There's lots more to do: examine the collection at Moss Mansion, sample the tasty concoctions at Canyon Creek Brewing, stop by Scheels, and learn about winemaking at Yellowstone Cellars & Winery. To find maps, where to stay, more things to do, and other tourist information, you can read our Billings holiday builder tool . Los Angeles to Billings is an approximately 4.5-hour flight. You can also do a combination of train and flight; or drive. Due to the time zone difference, you'll lose 1 hour traveling from Los Angeles to Billings. Plan for little chillier temperatures traveling from Los Angeles in May, with highs in Billings at 67°F and lows at 45°F. Cap off your sightseeing on the 16th (Thu) early enough to go by car to West Yellowstone. Deepen your sense of the past at sights like Earthquake Lake and Yellowstone Historic Center. You'll explore the less-touristy side of things at Fishing Charters & Tours and Horseback Riding Tours. Next up on the itinerary: get in on the family fun at Yellowstone Big Gun Fun, look for all kinds of wild species at Grizzly and Wolf Discovery Center, and have some family-friendly fun at Madison Avenue Old Time Photos. To find reviews, other places to visit, where to stay, and other tourist information, read West Yellowstone trip itinerary builder . Traveling by car from Billings to West Yellowstone takes 4.5 hours. Alternatively, you can fly; or take a bus. Traveling from Billings in May, things will get slightly colder in West Yellowstone: highs are around 57°F and lows about 31°F. Finish your sightseeing early on the 19th (Sun) so you can travel to Butte. Butte is a city in, and the county seat of Silver Bow County, Montana, United States. Start off your visit on the 20th (Mon): get engrossed in the history at World Museum of Mining, see the interesting displays at Old Montana Prison Complex, then see the interesting displays at Yesterday's Playthings, then get a taste of life in the country at Grant-Kohrs Ranch, and finally see the interesting displays at Powell County Museum & Arts Foundation. Here are some ideas for day two: examine the collection at MBMG Mineral Museum, then steep yourself in history at Copper King Mansion, then get great views at Old Lexington Stamp Mill and Gardens, and finally brush up on your knowledge of spirits at Headframe Spirits. To find traveler tips, reviews, and tourist information, read our Butte online vacation planner . You can drive from West Yellowstone to Butte in 3 hours. In May, daily temperatures in Butte can reach 61°F, while at night they dip to 34°F. Wrap up your sightseeing on the 21st (Tue) to allow time to drive to Helena. Helena is the capital city of the U.S. Start off your visit on the 22nd (Wed): admire the striking features of Original Governor's Mansion, get engrossed in the history at Montana Historical Society Museum, then take in the spiritual surroundings of Cathedral of St. Helena, and finally ponder the world of politics at Montana State Capitol. Get ready for a full day of sightseeing on the next day: get a taste of the local shopping with Archie Bray Foundation, sample the tasty concoctions at Lewis & Clark Brewing Company, and then indulge your thirst for a good beer at Blackfoot River Brewing Co.
To see maps, where to stay, and more tourist information, read our Helena trip planner . Traveling by car from Butte to Helena takes 1.5 hours. Prepare for somewhat warmer weather when traveling from Butte in May: high temperatures in Helena hover around 67°F and lows are around 42°F. Finish your sightseeing early on the 23rd (Thu) to allow enough time to drive to Great Falls. Great Falls is a city in and the county seat of Cascade County, Montana, United States. On the 24th (Fri), get to know the fascinating history of Lewis and Clark Interpretive Center, admire the masterpieces at C.M. Russell Museum, and then steep yourself in history at First Peoples Buffalo Jump State Park. Keep things going the next day: pause for some serene contemplation at St. Ann Cathedral, take an in-depth tour of Ursuline Centre, then pause for some serene contemplation at Holy Spirit Catholic Parish, and finally admire the majestic nature at Giant Springs State Park. For photos, ratings, other places to visit, and other tourist information, use the Great Falls holiday maker tool . Traveling by car from Helena to Great Falls takes 2 hours. Alternatively, you can take a shuttle. May in Great Falls sees daily highs of 65°F and lows of 39°F at night. Wrap up your sightseeing on the 25th (Sat) to allow time to drive to Glacier National Park. 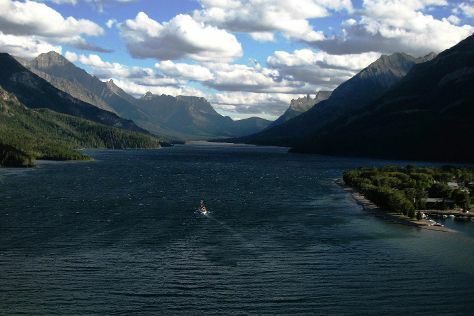 Explore hidden gems such as Waterton-Glacier International Peace Park and St. Mary Lake. Next up on the itinerary: appreciate the extensive heritage of Garden Wall, contemplate the waterfront views at Two Medicine Lake, admire all the interesting features of Going-to-the-Sun Road, and take in the dramatic natural features at Jackson Glacier Overlook. For reviews, photos, and other tourist information, you can read our Glacier National Park trip itinerary site . Traveling by car from Great Falls to Glacier National Park takes 4.5 hours. Alternatively, you can do a combination of bus and car; or do a combination of bus and train. In May, daytime highs in Glacier National Park are 67°F, while nighttime lows are 38°F. Finish up your sightseeing early on the 29th (Wed) so you can travel back home.